Ignoring Teddy’s ominous warnings, Mr. Fischoeder makes an infamous mechanical shark the prize attraction at his amusement park. When the machine goes berserk, only the love of teenage nerd can save it. ﻿AVC: This episode is the middle act of the Bob’s Burgers Spielberg trilogy: “The Deepening” is your ﻿Jaws﻿, last year’s “The Belchies” was ﻿The Goonies﻿, and then you got to ﻿E.T.﻿ later in season three. ﻿LB:﻿ I hadn’t thought of it that way, but you’re absolutely right. ﻿What’s nice about ﻿Jaws﻿—aside from being a movie that everyone loves and we can reference parts big and small—is it is also about a seaside town, and it has that feeling. It was such a natural for this show, because we already have the small, somewhat tourist-driven town on the beach. A mechanical shark that terrorizes the town on land hearkened back—in a good way, I hope—to the “Land Shark” sketch from ﻿Saturday Night Live﻿: The silliness of that, and the smallness and bigness at the same time. [“The Deepening” is] a big episode. We full-on destroy the restaurant, but we also just have this very sweet character story. ﻿AVC: Were there any challenges in animating the shark? Was there anything out of the ordinary the animation company, Bento Box Entertainment, had to do to accurately portray the way the shark wobbles along on its side? LB: That was [Laughs.] a lot of work. The director on that episode is a guy named Bernard Derriman. He’s now our supervising director. He proved his mettle on this episode and we now have him looking at all the episodes because he’s so good. One of the things he brought in—it’s not groundbreaking, but it was for us—was this idea of using some CG and then drawing over it. That support structure that’s flopping around with the shark, combined with the shark itself, was going to be such a headache that he hired a 3-D guy, designed the shark, and then did the basic keyframe animation in CG so we could really be sure that we had our angles right before we started drawing. Otherwise, it was just going to be a nightmare. We started with such a simple world. It was going to be a dialogue-driven show, it was going to be set in a restaurant, and so you could forgive anyone who came to this thinking that it was going to be a fairly low-budget, talky production. But as we’ve been writing, some of these bigger stories just needed to be done. “The Deepening” was such an appealing idea: seeing how our characters could handle a bigger story like this, which calls for a lot of animation, design, special effects, and crowd scenes. We’ve ﻿never﻿ gotten pushback from Bento Box, but it is absolutely terrifying for them to get this show done, on budget, on time, and on schedule when we come in with these crazy scenes. But they’re fearless. If they like the story—because they’re part of the vetting process—then that’s it. Then we get a mechanical shark and it goes up Ocean Avenue, sending things flying through windows. If you had given us a flash forward when we were working on episode one, I guess we all would have said that’s crazy. But what’s nice is that we all got there organically, and they didn’t even blink. ﻿AVC: When the shark is tearing through the floor of the restaurant, Teddy says, “We’re going to need a bigger restaurant,” and Bob’s response is just, “Oh, come on!” Is that a statement from the writers about reaching for the easy reference in that moment? ﻿LB: ﻿[Laughs.] It’s not even a statement. It’s not like we want to call anyone else out for doing it. It’s that we wanted to do it, but then we also wanted to own it at the same time—like, “We should have one of our characters comment on that.” So that’s all that is: the urge to reference and then the urge to commentate. AVC: This episode marks the first season-three appearance of Hugo, the restaurant inspector. He’s voiced by Sam Seder, whose Home Movies character had a similarly needling and antagonistic relationship with the protagonists. Does his voice just lend itself to that character type? ﻿LB:﻿ [Laughs.] For me, it’s not necessarily about Sam’s voice being irritating—though he certainly does that very, very well. What I love is having him and [H. Jon] Benjamin working together. He and Benjamin go back a ﻿long﻿ time: I don’t know if they knew each other as young kids, but they knew each other a little bit in high school, they knew each other in college, and they’ve been doing comedy together in some form ever since. Sam is very, very funny by himself, but I especially love hearing them interact. It’s just so effortless for them to go in and out of pretending to be annoyed with each other. They don’t even have to talk about it—they just find funny beats and ways of interacting. You know, I did have a different kind of role for Sam: He was one of the special fathers in ﻿Lucy: The Daughter Of The Devil﻿, and he and Benjamin were pals and he didn’t explicitly… eh, that’s not true. He annoyed Benjamin in that role, too. Never mind. ﻿AVC: You’ve got such a deep stable of vocal talent on the show, some of which you’ve been working with since Dr. Katz. At this point do you feel like you know what everyone has in their tool belts? Is there a moment where one of the actors that you have a long history with surprised you with the way they’ve approached a character? ﻿LB:﻿ You never want to assume that someone’s got a whole other voice they can do—but boy, oh boy, is it amazing not just that they can do a voice, but that they can live in it. I’m thinking of Larry Murphy: He came in as Teddy and he was so funny. I knew he could do that voice—I had seen him do this Sal Lupo character on YouTube and he loaned us that voice for Teddy. Then we asked him to play Gretchen in season one, and we didn’t think that was going to be a big part or even a recurring character. She was just this funny, brassy gal in the “Lobsterfest” episode—but he can do that character and that voice all day long. You buy it instantly, whatever he’s saying as Gretchen or as Teddy. The eldest Belcher child believes she’s cursed after causing one of the longest, slowest, lowest-impact traffic accidents in TV history. ﻿LB:﻿ I love that this particular spread [of characters] has given us a lot of breadth, in terms of the little phases of childhood from ages 9 to 13. I’m especially happy having Tina as this proto-teenager that’s ﻿such﻿ a teenager but also just figuring it out, just getting her feet wet in that area. “Tina-rannosaurus Wrecks” is a good example of that idea: “Yeah, you’re 13, your dad might let you drive in the parking lot.” We’ve all been there: We relate, we remember. And what’s the worst thing that could happen? That scene… [Laughs.] We knew it was going to be funny. We were excited about it. [Benjamin and Dan Mintz] performed it ﻿so well﻿. Bob’s fear mixed with hope as he slowly, quietly tries to let Tina know that she’s headed toward the only other car in the parking lot and then this mounting terror… it’s just such a pleasure. Just seeing that overhead shot of the car ﻿slowly﻿ pulling forward and then weaving side to side and the distance that the other car is from it—that had to be just the right distance so you wouldn’t quite see it coming from the first shot, but then start to fear that this is where it’s going and it just came out so well. AVC: There are a lot of teenaged characters on TV who have the typical teenage problems and desires that Tina does—but her age gives her a unique perspective on such things. ﻿LB: ﻿Though, if she were real and she got to be 15 and 16 and 18, she’d always have a unique take. It’s largely due to having this voice come from Dan Mintz, where you can’t write certain lines—they’re not going to sound right coming out of her mouth. We write a lot of lines that we ultimately cut; there are lots of drafts that get thrown away because they’re not right for the character. I’m not saying it comes automatically, but in the end, it does feel like a pleasure to write for that character because she’s got such a unique voice. But it’s not really any different from real people. What it is different from is the clichéd characters on TV. She’s not a capital “T,” capital “C” Teenage Character. ﻿AVC: Do you pay attention to the show’s online following at all? Are you surprised that Tina has become the Internet’s favorite Belcher? ﻿LB:﻿ We do pay attention. I feel ﻿so ﻿grateful to be doing this in the Internet age. I did ﻿Dr. Katz﻿ before the Internet—we felt lucky and felt good doing the show, but it was ﻿quiet﻿. We were also living in Boston, so we never really experienced our audience. We were at home watching the broadcast and then we’d go into work and make the show. We could only trust our gut and the fact that [Comedy Central] ordered more episodes. Nowadays, being able to hear people repeat their favorite jokes back to each other and dissect parts of the story and discuss the characters with the same care and attention that ﻿we﻿ discuss the characters is incredibly luxurious and pleasing. I don’t expect the audience to do that, but I love that we’re not the only nerds in the world who are giving these characters this much of our focus. It makes it seem like we’re doing something of value. If we were doing this back in the cold, dark ’90s, I would optimistically hope for that, but I wouldn’t assume it. The fact that Tina resonated is so great. It feels so intimate and so familiar because Tina was making ﻿us﻿ laugh—I mean, all the characters make us laugh and I don’t have a favorite because I feel like that wouldn’t be fair to any of them, but to have a character resonate with so many people in such a real seeming way is such a pleasure. Especially if it’s a character who hasn’t really been seen before, and maybe even an audience that hasn’t had a character to latch onto like that. AVC: Bob Odenkirk’s guest character makes a heel turn in “Tina-rannosaurus Wrecks,” where it’s revealed he’s preying on the Belchers for the benefit of the insurance company. It’s a very Bob Odenkirk-character pivot—was the part written with him in mind? ﻿LB:﻿ I can’t remember if we started with him in mind, but we quickly had him in mind. We were embarrassed and sad about the fact that he also does this Saul character [on Breaking Bad]—we didn’t want it to be too close, but we also knew that he would do a good job. Jon Schroeder—who wrote the episode—knows Bob, and they’d talked about doing the show. [Odenkirk’s] kids watch the show, and I think that he actually didn’t tell them he was going to be on until they watched it together. So, as a surprise, he got to sit down with his kids to watch ﻿Bob’s Burgers﻿ and there he was. ﻿Gene has trouble dumping his obnoxious, orally fixated first girlfriend after he discovers her father is a jingle composer with a massive cache of musical instruments. AVC: Who came up with the concept of Courtney always chewing on her necklace? ﻿LB:﻿ That was probably Holly Schlesinger, who wrote the episode. We wanted this specific flavor of annoying where you could buy that she was “the most annoying girl in school” ﻿and﻿ that Gene would then talk himself into like-liking her. Casting David Wain also helped a lot because he did such a good, funny, weird job as Courtney. ﻿AVC: What did he do during the recording to replicate that noise? LB:﻿ Sucking on a pen. A little bit of studio magic. Though I think he was in New York when he recorded that—I could be wrong, but I have a memory that I wasn’t looking at him when he was doing that part. 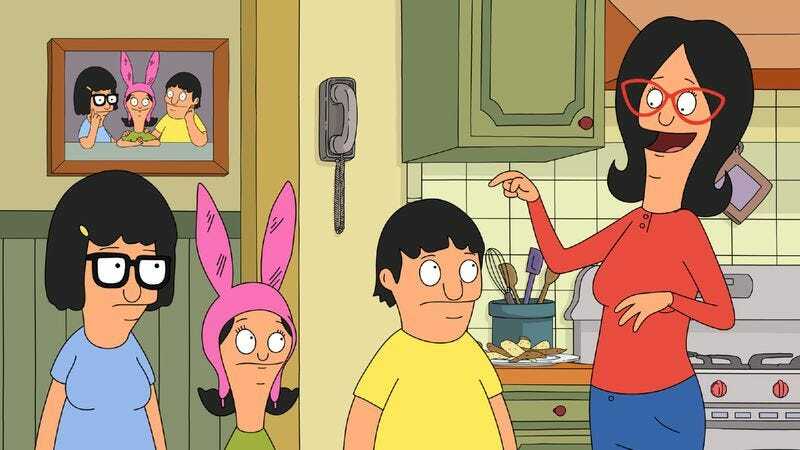 ﻿AVC: What is it about casting male actors as female characters that suits Bob’s Burgers so well? ﻿LB:﻿ For me it’s similar to having an adult play a kid: You get a weird energy from that voice that doesn’t quite fit. And it’s not ﻿the﻿ joke. It’s not that a man is doing a woman’s voice. It’s just how to get that energy on the screen and in the track. Sometimes, the way to do that is to have a woman play a woman and have a man play a man, but other times cross-gender casting will get you that. We’re not trying to take work away from funny women—it’s another way to get an interesting voice coming out of a character’s mouth. Whatever you can do to get a good voice, I say do it. If we need to pitch-shift, do that. If it takes a lot of editing or helium—whatever it takes. Just get that track really to pop and sound like it couldn’t have been anyone else voicing that character. AVC: Is Courtney’s father’s “gear heaven” similar to the musical setup that you have in the Bob’s Burgers offices? Where are you making all of the music that’s being put into the show? LB:﻿ [Laughs.] The music is made in a couple of different places—but yeah, in each location it looks like that. Every modern-music dork has a room in their house that looks like that. With technology what it is today, you can have your home studio for not that much money. If you’re like me, you get your computer, your keyboard, your couch—which will have drum machines on it. Maybe one day in a fit of cleaning up you bought those guitar hangers, which makes perfect sense and is also dorky. I love that Gene fancies himself a music-maker. He’s very much me when I was his age: not particularly talented, but full of passion. He just ﻿gets﻿ what’s great about keyboards and drum machines and wants to fool around with them. He just wants to sample farts and play them back at different pitches. So it was easy to put that into this episode, and we loved John Michael Higgins as Courtney’s dad, Doug. I think he did such a fantastic job with that guy. Just dorky and proud of his gear. AVC: Almost every episode of season three has its own musical number, whether it’s integrated into the narrative of the episode or it’s played under the credits. At what point during the evolution of ﻿Bob’s Burgers﻿ did you decide that music was going to play such a major part in the series? LB: Pretty much from the get-go. I didn’t want to assume that we could do a unique end credit bed for every episode—it’s a lot to ask from a production perspective. When we worked on Lucy: The Daughter Of The Devil, we treated each episode like a little mini-movie, and the opening credits had a new look and a new song every time. It was a tall task, even for a smaller cable show with some of the freedoms that you get with that. But it’s just really fun to work on music for the show. There are other musicians who work with me, but one incredibly nice thing I do for myself is I hire myself as a composer and a musician. I’m fully aware that I had to first create and run a show in order to get the gig of composing and recording. The real musicians that I work with, they’re actually qualified. [Laughs.] John Keith is a brilliant musician that I worked with on Lucy, and I’ve known for over 20 years. The Elegant Too is a team that came on more recently—they’re out of New York and they make fantastic music—I worked with them on a pilot I did called Saddle Rash. The second part is, I think music and animation go together so well. I don’t know if it’s just because Walt Disney started this tradition and married the two in our collective minds, but I just think if you’re watching a half an hour of animation, there should be a musical moment somewhere in there. It’s part of the bargain that we're going to give you if you come to an episode of Bob’s Burgers—even if it’s small, even if it sounds like we rushed it together at the last minute and it’s silly. It puts you in a certain mood. The ukulele, when it works, it makes you smile. That sounds really corny and I hate to trot that out, but, you know, that’s what we’re trying to do here. Imbued with the Christmas spirit, The Belchers invite a man with an unbelievable story into their home. His story: That he’s a mannequin come to life who’s just trying to reunite with his lost, immobile love. LB: We wanted to do a Christmas episode, but we didn’t want to feel like we were following in anyone else’s footsteps. We didn’t want to be cynical, we didn’t want to be making fun of a comedy doing a feel-good Christmas story—so right there was the challenge: how to have it feel like our show, but then have it be what the best of those Christmas stories are all about. Miracle On 34th Street and How The Grinch Stole Christmas—those stories are incredibly resonant not only because we’ve all seen them every Christmas since we were kids, but also because they were conceived with a lot of real heart and they do a good job of trying to shine a light one what’s so nice about this particular holiday. They can be thoroughly non-denominational and non-religious, because they’re just picking out a couple of values that resonate around this time. AVC: Was there any discussion of whether you were going to provide an answer as to what was going on with Chet? LB: Frankly, we all talked about it as if he were delusional, and we had a backstory worked out for him where he was a real person that just came to believe he used to be a mannequin. In our minds, he was a window dresser that worked in that department store and then had a breakdown after the store closed. But we never doubted as we were writing whether it was true. But it’s nice to then craft a story where you don’t have to be explicit about that. That’s just something you need to know as the writer. And we were very happy that we ended up having this part available for Zach Galifianakis. We’d been wanting to do something with him for a while—we’re big fans and a lot of people on the staff are friends with him—but every time we lined him up, he wasn’t available. So it was great that this character came along when Zach could do it. AVC: The other main guest in the episode is Fred Stoller, whose character bears a striking resemblance to him. Did you do that on purpose? LB: No, we didn’t. We’re legally not allowed to design characters that look like the actors that play them. AVC: Is that a standard across the board for animated shows? LB: I don’t know if it’s limited to 20th Century Fox or not, but it’s just a little bit of good legal hygiene—so there’s no confusion about whether a character belongs to an actor. Personally, I love drawing characters that look like the actors, and I’d do it every single time. That was Dr. Katz’s bread and butter. We’d have these Polaroids and bring them over to the animators and have them draw them as lovingly as they could. But we don’t do that on Bob’s because we’ve been told not to. AVC: Do you find that the Belchers’ financial status frees you up to tell certain kinds of stories? This episode is based in the notion that the Belchers, as a working-class family, couldn’t afford the wild, Christmas fantasia you might see on other shows. LB: Sometimes it feels limiting, but because you have to ask that question of “Can they afford this?”, it grounds us. We’re always going to be true to some version of reality. And in that version of reality, we can fool around at the edges and it’s not going to be absolutely true to life—but the Belchers being a working-class family who don’t have a lot in savings and can’t afford everything that they want is really helpful for us to just get our bearings when we’re writing. We might accidentally write some of these crazy stories where they go off on wild adventures where anything can happen and anything’s possible. I’d rather limit it. AVC: Is this an episode that demonstrates that Louise and Linda are more alike than either one wants to admit? LB: If they’re not more alike, they’re at least much more compatible than either would admit. But there’s a lot of real love there, and we wanted to end this episode where that’s not in question. We wanted to come down to that moment when Louise says, “You thought I didn’t like you?” She didn’t even realize that was possible—of course, she likes her mother. AVC: When you were working on this episode, was there discussion among the parents on the writing staff about that particular worry? LB: Nora Smith wrote this episode—she doesn’t have kids—but when she was developing it, we talked about my kids. My oldest son, especially, would ask for “daddy” and make my wife feel bad. And Nora compared it to her family—she and her brother would sometimes take their mother for granted. She’d talk about going on family walks, and her mother would be trailing behind reading the plaques while they were visiting a historic town. [Laughs.] And claiming to be fine! [Adopts a motherly voice.] “Oh, I like it! You go walk with your father. I like plaques.” And I don’t know how much of that is true, but we talked about the injustice that’s visited upon mothers when their kids start branding the dad as “the fun parent” and how wrong that is. AVC: Tina uncovers a deep-seated affection for her leg hairs in this episode. Is there a limit to her empathy for inanimate objects? LB: Not really. She’s a big-hearted girl with a lot of love to give, and it’s the small, defenseless things of the world that she’ll give it to every time. When Teddy puts it that way—his “furry friends”—and she suddenly sees that she was a victim of peer pressure in the most vain way, it seems totally earned. You’ll see it again. We like having a character who feels that much, that strongly, and is willing to give it up even for inanimate objects. AVC: What was the basis for Linda’s hair-braiding song? How did Harry Truman work his way into that? LB: That is straight from the warped and wonderful mind of Nora Smith. I can only guess that it came from her mind because his name is Harry—[Sings.] “Here goes the hair, and there goes the hair.” A brilliant and bizarre song if there ever was one. It just came fully formed out of Nora’s brain.